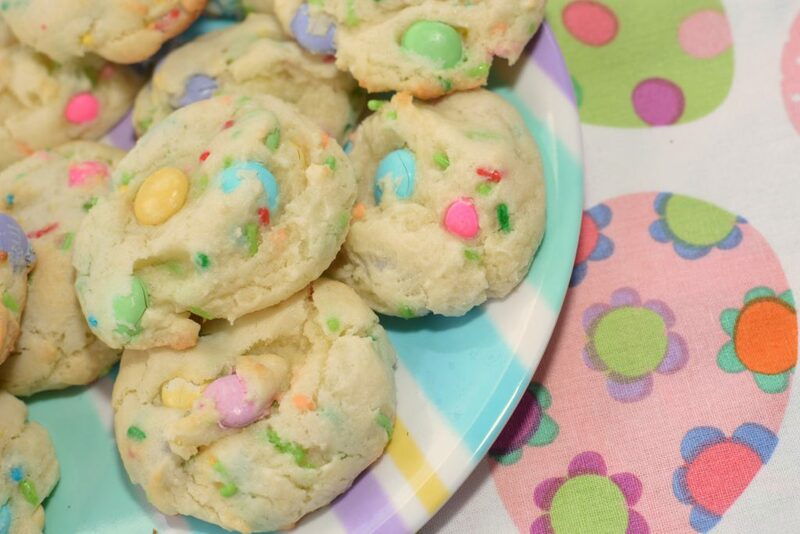 With Easter coming up, try these simple Funfetti cookies using a cake mix, M & M’s, and sprinkles of your choosing! 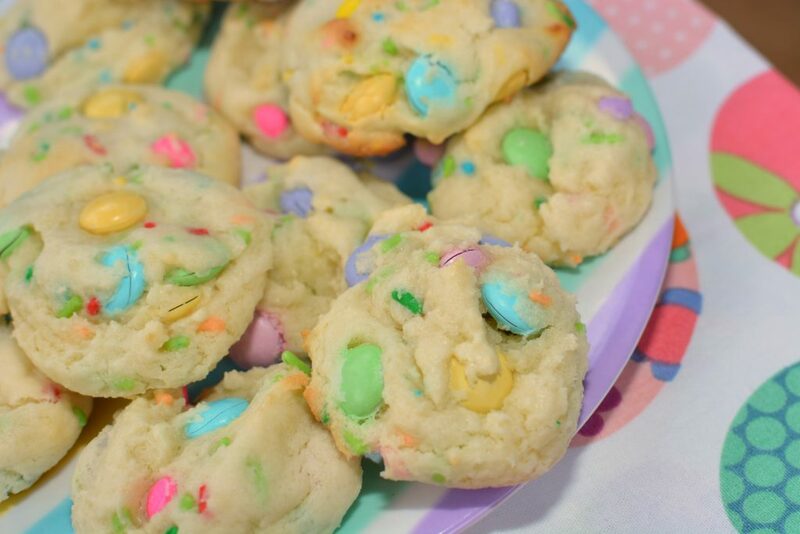 The Easter Bunny is surely to hop on over to snack on these tasty treats! A few days ago, my local grocery store was having an Easter sale on their candy. Since I couldn’t pass up a 50% off sale, I grabbed a few bags of the pastel colored M & M’s and proceeded on with my shopping trip. I had no idea how I was going to use them, but hey, a sale is a sale, right?!! Once home, I immediately started browsing through my cookbooks, magazines, online apps, etc. looking for inspiration. I knew I wanted to make a cookie since those are my kids favorites treats! I had the idea to use cake mix since in the past, I used chocolate cake mix for cookies and it was delicious! Being Easter however, I opted for Funfetti this time. 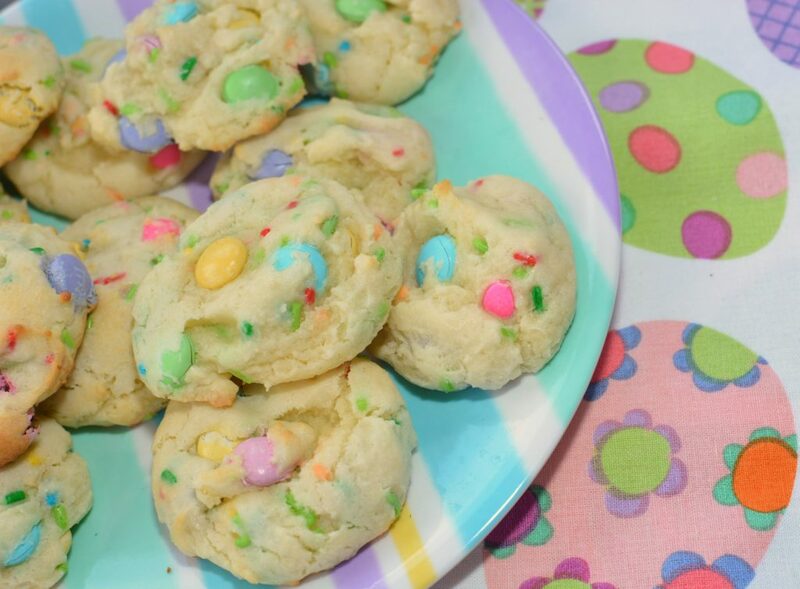 Adding some Easter sprinkles and the M & M’s I had picked up, these cookies come together in no time and were a huge hit! 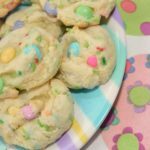 My kids came home from school a few hours after I had baked these and each had two cookies quickly. Their favorite part was the sprinkles of course! I ended up sending a plate into work with my hubby the next morning and within a few hours, he text me to let me know that several people had stopped by his office to let him know how much they too had enjoyed the cookies. They said the cookies were soft, chewy, sweet, and the best cookies ever! Impressive, right?! All from a cake mix! 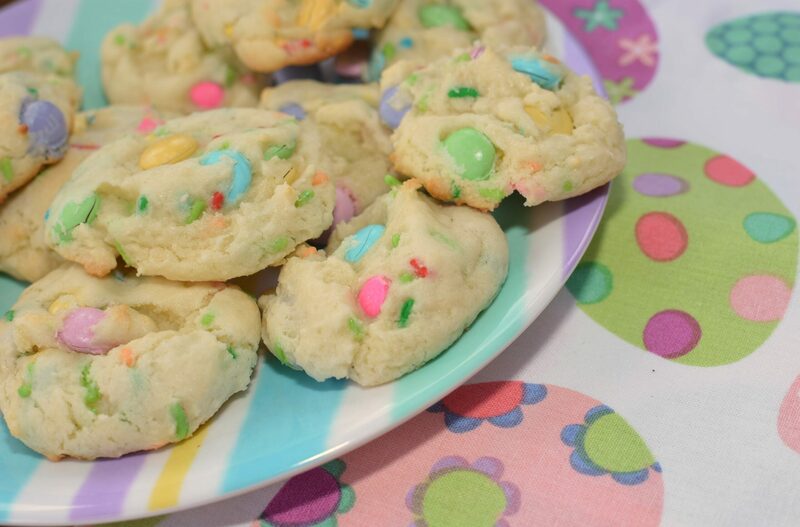 If you are looking for a festive Easter treat, kid friendly snack, or dessert to set out on your table for Easter gatherings….try these cake mix cookies! Save the time on whipping up a batch from scratch because hey, if it comes out of your oven, its homemade, right?! LOL! A festive cookie using sprinkles, m & m's, and funfetti cake mix!! In a medium bowl, combine the cake mix, oil, and eggs. Once combined, fold in the sprinkles and m & m's. Shape dough into 1' balls and place on a cookie sheet about 1-2 inches apart. Place cookie sheet in preheated oven and bake for 6-8 minutes, or until slightly golden in color on the edges. Remove from oven and continue process until all the dough is used up. 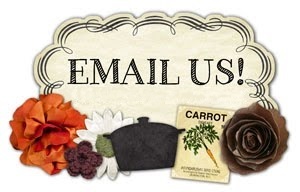 Have you signed up for my free newsletter?? If not, its simple! 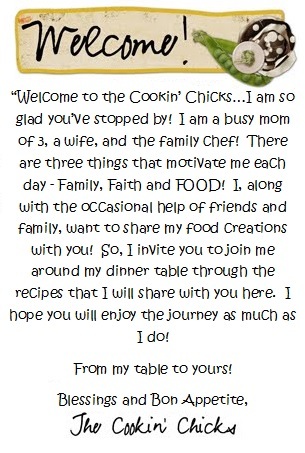 Go to my blog, www.thecookinchicks.com, and on the right hand side, you will see a place to enter your email address! Once you enter it, be on the lookout for a confirmation email. Once confirmed, you’re set! You’ll receive my newest recipe via email, get fun tips, information, and you get first access to all my prize giveaways! !